The Saalbach-Hinterglem Ski Circus is one of Austria’s largest ski areas with over 270kms of marked pisted connecting the 4 resorts of Saalbach, Hinterglemm, Leogang and Fieberrunn. Investment within the ski circus lift infrastructure has been phenomenal – all the lifts are fast moderngongular style cable cars, 8, 6, or 4 man chair lifts – perhaps the only exception being the Seekarlift highabove Hinterglemm which remains a nostalgic T Bar! Saalbach is partly traffic free. Shops, bars and hotels all line the main street with the Schatberg bubble lift at one end and the Kohlmaiskopt and Bernkogel lifts at the other. Saalbach is not just about skiing… the Apres Ski is legendary – The Hintethagalm starts bouncing at 3.30 but you have to ski back down to the village when the bar closes at 8pm!! Other Apres ski bars include Bauers Ski Alm and Kohlmais Stub’n. Apres ski does finish at 8 though after dinner the vibe in the village continues in anyone of the many bars and clubs. A regular ski bus connects Viehofen at the foot of the valley thtough Vorderglemm, Saalbach and up to Hinterglemm. This allows you to start and finish your ski day anywhere along the Glemm Valley! 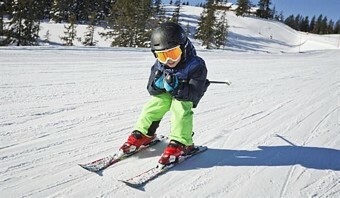 We recommend Snow Academy on the main street in Saalbach. Helmut and his team offer a wide selection of skis in a great location. 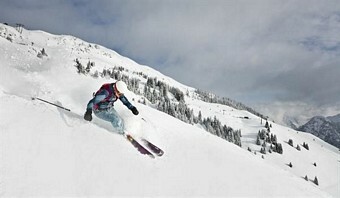 Book online here: http://www.skirent-saalbach.at/en/ or just add ski hire to your holiday booking. The Saalbach Ski Circus is one of Austria’s largest connected ski areas with over 270kms of piste connected by a new fast efficient network of 82 lifts linking the 4 villages of Fieberbrunn, Leogang, Saalbach and Hinterglemm. Under the watchful eye of your Austria Ski Instructor you will soon gain enough experience to move up the mountain tackling the green and blue runs underneath the 6 man Bernkogel chairlift. After a couple of days you will be able to venture further afield skiing the net work of blue runs either over to Leogang or Hinterglemm. The Ski Circus will test every intermediate skier. Start with the Schatberg bubble lift up to 2020m bareleft and take the long blue (well some parts are a little red in colour 😊) 2b Jausernabfahrt down to Vorderglemm. At the top of the Schonleitenbahn you can decide to go left towards Saalbach / Hinterglemm or right to Leogang. 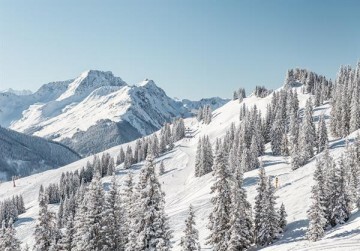 The slopes above Leogang are a skiers paradise – north facing bowls ensure great conditions throughout the season. 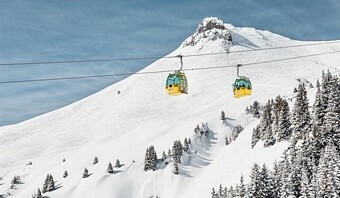 The Asitz run down from Kleiner Asitz to Leogang is often referred to as one of the best intermediate ski runs in the Alps. 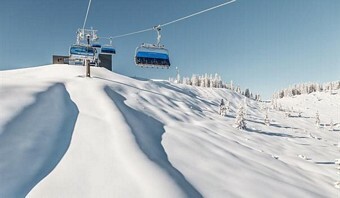 The new Steinbergbahn has opened up a delight wide open blue piste down to Leogang. Over towards Hinterglemm the ski runs underneath the Sunliner quad chair are wide and open. But for a real challenge take one of the bubble lifts up to Zwolferkogel and ski the WM Abfaht down hill run back towards Hinterglemm. Advanced skiers are a little spoilt for choice! We love a warmup on the Schattberg – a long steep black run which drops 1000 vertical metres down to Saalbach. Back up Schattberg and take the bubble up to Schattberg West then head down to Hinterglemm on the red Westabfahrt – up to Zwolferkogel then the steep red … perhaps in some other resorts it would be a black … Zwolferkogel Nordabfahrt. Cruise along the south slopes above Hinterglemm beforedropping down under the new TirolS bubble lift towards Fieberbrunn. The slopes above Fieberbruun are open steep ad demanding with choices of reds or off piste itinaries. Take a morning (or afternoon) to explore Leogang – especially lower down – the Tarlackabfaht maybe a short black but its also one of the steepest around!! Off Piste – head up Schattberg for some open steep easily accessible bowls. Then move over to Zwolferkogel above Hinterglemm – the Seekarlift offers some interesting routes down. Underneath the Zwolkfer Nord bubble lift- steep open slopes that descent into open trees. But Fieberbrunn is epic – the area hosts one of the rounds of theFreeride World Cup Tour (along with another one of our resorts Arcalis in Andorra!) 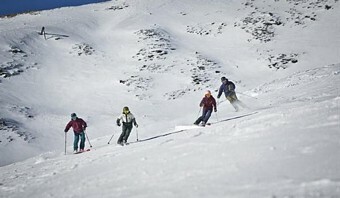 -with a number of dedicated off piste routes – marked but not patrolled or prepared. 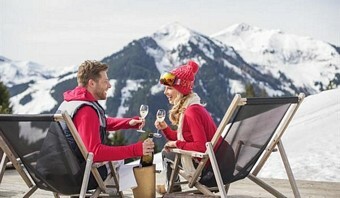 Something you don’t have to worry about in the ski circus is not being able to find a mountain restaurant for a morning coffee, lunch or an afternoon beverage. You will find a place to stop at virtually every lift or run!! The nearest airport is Salzburg. The transfer time is around 1½ hours. Transfers from Salburg are by minibus or coach. The main transfer day is Saturday. Alternative arrival airports are Munich (transfer time 2½ to 3 hours) and Innsbruck (1½ to 2 hours) transfers from both Munich and Innsbruck are available by shuttle bus or by train. The nearest railway station is Maishofen and Saalbach is just 15 minutes by taxi or postbus.